Industry and Commerce Minister Rishad Bathiudeen receives a copy of the book from author M.L.Sarifdeen at the event. A research book titled ‘Paarampariya Kalaigalum Thozlil Muraigalum’ (Traditional Arts and Vocational Systems) authored by Senior Journalist and Announcer M.L. Sarifdeen was launched at the Akkaraipattu recently. 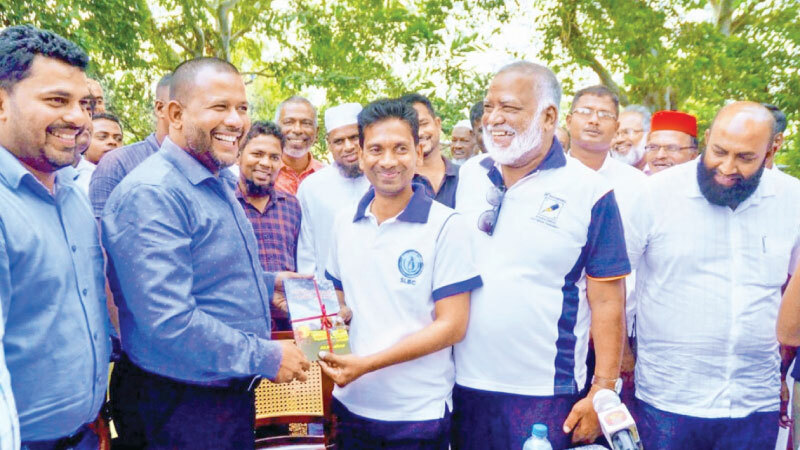 Industry and Commerce Minister and All Ceylon Makkal Congress Political Party Leader, Rishad Bathiudeen receives a copy of the book from author M.L. Sarifdeen, at the Manthai Weast area in the Mannar district at a ceremony. Senior Journalist, Kalaboosana Meera S. Issadeen, Consumer Affairs Authority Executive Director, M.A.Anzil, the Manthai West Pradeshiya Sabha Chairman, A. Santhiyahu, Nintavur Pradeshiya Sabha Chairman, M.A. Thahir and many others participated on this occasion.